Our goal as wedding photographers is to always make our subjects look absolutely stunning on their big day. This job comes quite easily when you come across a bride as gorgeous as Andrea. It is very important to get shot of the bride in her full attire, and I always try to capture this in a unique way. 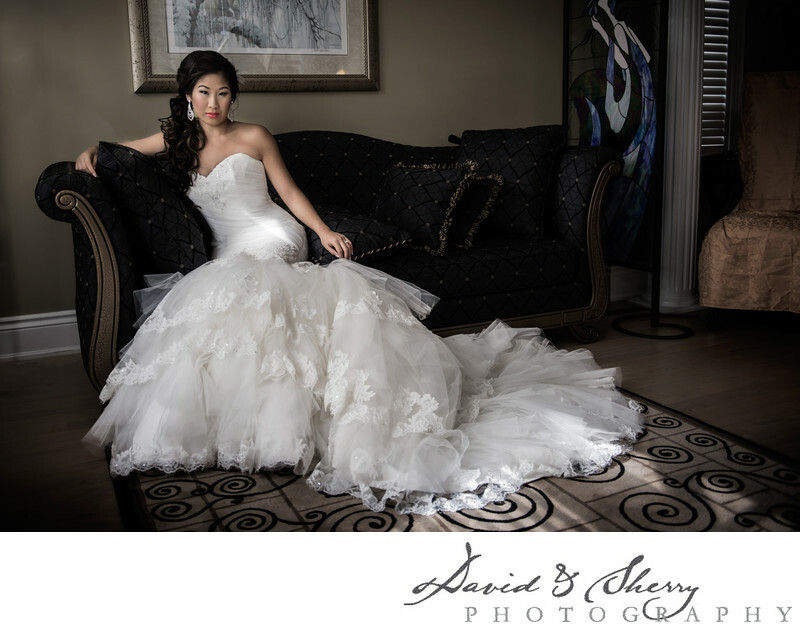 I chose this elegant couch in the hotel room to feature in the photo because it fits the style of the bride: classy with a touch of modern. Since the couch is so dark, her luxury gown pops against the background and draws attention to the lace and ruffles on the bottom of the dress. The bride chose a mermaid silhouette gown with a beaded bodice and lace skirt, which suited her perfectly. The whole look was tied together with a voluminous side up-do with cascading curls, and an airbrushed makeover complete with a bright lip and full eyelashes. This breathtaking photo of the bride-to-be was shot at the Trump International in Vancouver, British Columbia. This high-end hotel is a slick and modern tower in downtown Vancouver. Weddings that take place here are all very posh and stylish, always a favourite venue for wedding photographers in BC. Location: 1151 West Georgia St. Vancouver, B.C..